The marketer's nightmare is to put on a show and have nobody turn up. Why then, would Coldwell Banker make a buzz about their three million dollar show home in Second Life, and then make it hard to find? To be fair, a teleport sign is (at least as of Friday) up in their office that will take you there, but it isn't exactly a standout. If you read about the home, and wanted to see it in Second Life, you'd have no hope -- the sign isn't labeled. You'd already have to know what it looks like to identify the sign that takes you there. 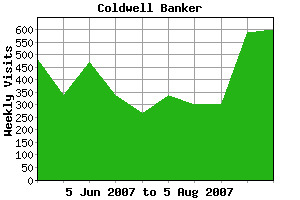 Judging by Coldwell Banker's ranking (600, up only 2% since the announcement; they did far better the week before), having a hard-to-find show home is just not doing the trick for visitor interest, despite the site having about as much information as the prospective home-buyer could seem to want about this property. In case you're wondering, the replica of this Seattle home is located here, in Ranchero. We'll be watching that space, and seeing what eventuates. After the fold - why pay people to come to a marketing site, when people can pay to be there? The Pond is generating goodwill, and people are paying for it. Sitting with Very Mulberry (Big Pond) and developer Gary Hazlitt (The Project Factory) at The Pond's Billabong Bar. Corporations have tried a wide variety of traditional marketing gimmicks on the Residents of Second Life to get them to come and drink the corporate KoolAid. Marketers have tried ignoring them, insulting them, misunderstanding them and bribing them. The Pond, on the other hand, is following in the footsteps of Showtime's The L Word, and renting living space to residents. The terms and conditions smack a little strongly of contractual legalese but, the basic conditions set out all make sense. Judging by the boost in traffic throughout The Pond since the commencement of the rental plan, this plan certainly seems to be something of a hit. Jonas Ingrassia is one of the new tenants there, and so far, a very happy one. He doesn't feel bombarded with corporate branding or feel like Big Pond (the business behind The Pond) is getting in his face or being intrusive. There's always the nagging suspicion that it might, in time. "I suppose we're sort of waiting to see," Ingrassia told me, "So far, the neighborhood and our neighbors do seem to be creating a community, and that's worth something to us." 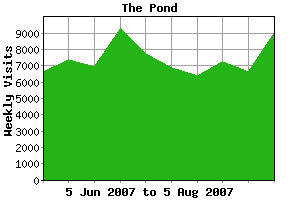 Ultimately The Pond is delivering what seems to be good value at a fair price, and even if it isn't the sort of product traditionally associated with them, goodwill is goodwill. Virtual Holland continues the generally upward trend, slowed, but not stopped by the recent grid-wide difficulties, and even Microsoft is gaining ground over time, though not nearly as quickly. Greenies Home fell a little this week, but the region was closed for a refit for a while, which prevented many would-be visitors. In the wake of the refits, the population limits have been increased and we expect to see traffic at this site continue to grow until it either becomes too laggy, or the novelty begins to wear thin. Lastly, at the bottom, Coca Cola is no longer the bottom of the chart. Without fanfare, there's been a winner of the competition. Since that spells the end of any fixed presence in Second Life for this fizzy drink, I've removed them from the chart, leaving Reebok (120), today, as the lowest-placing site in our rankings. That's not to say that Adidas (192) has any reason to celebrate. Both shoe brands have captured about equal mind-share in Second Life - that is to say, virtually none at all - but then, neither of them appear to be trying.